In recent years, concrete for interior design has grown in popularity. The growing need for a lasting and economically practical material is a sign that it will continue to soar into new heights. Gone are the days when concrete was known for its dull and gray feel. Now, the possibilities are endless with this material. If you haven’t tried it for yourself, it’s high time you do. Here are different ways you can get creative with concrete floors. Patterns add a dynamic look to any surface. There are different ways to achieve a patterned look for indoor and outdoor floors. 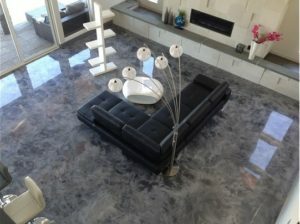 Pre-cast concrete is great for indoor floors with a modern vibe. Herringbone, geometrical, neat lines, and complete variation are just some of the pattern options for pre-cast concrete. Stamped concrete is highly popular for areas like the driveway, walkway, and patio. 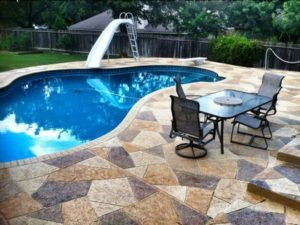 Stamped concrete offers more traditional yet extensive varieties of patterns. Color can be broadcasted in either options to complete the look. You won’t usually find concrete in areas like the bedroom or the bathroom. It’s harsh and cold nature is often blamed for its unpopularity in bedrooms. On the other hand, the porous surface of bare concrete inhibits bacteria in bathrooms. However, the popularity of industrial design tells us otherwise. Concrete can actually be a very practical flooring option for bedrooms and bathrooms. Epoxy and polished concrete applications have made concrete a sanitary flooring option for bathrooms. Concrete innovations have made it possible for bedroom floors to be warm to the touch. One of the ways creativity can truly be achieved is with varying hues. Whether you opt for soft and subtle pastels or loud and bold vibrant, colors are always a great way to start. There are multiple options for incorporating color into concrete floors. Concrete dyeing, staining and color hardeners are some examples. These coloring techniques can be combined with other concrete applications to top off a look. Another way to add color is to apply an epoxy coating. The epoxy resin can either be combined with pigment or with colored quartz/vinyl flakes. Concrete can indeed be a way to get your creative juices flowing when it comes to interior design. With the different decorative concrete applications available in the market, the possibilities are endless. Because it allows for a fully customized look you can definitely have it your way or any other way. If you want to know more about decorative concrete, visit our homepage. 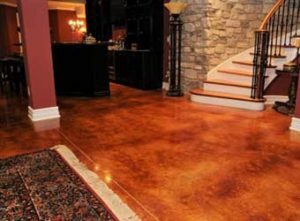 Check out our services for your concrete floor in Kansas City or read through our blog for more interesting articles.